As we were walking home from Sainsbury’s last week, we crossed a bridge over another old railway cutting that has been converted to an inviting shared walk/cycleway. 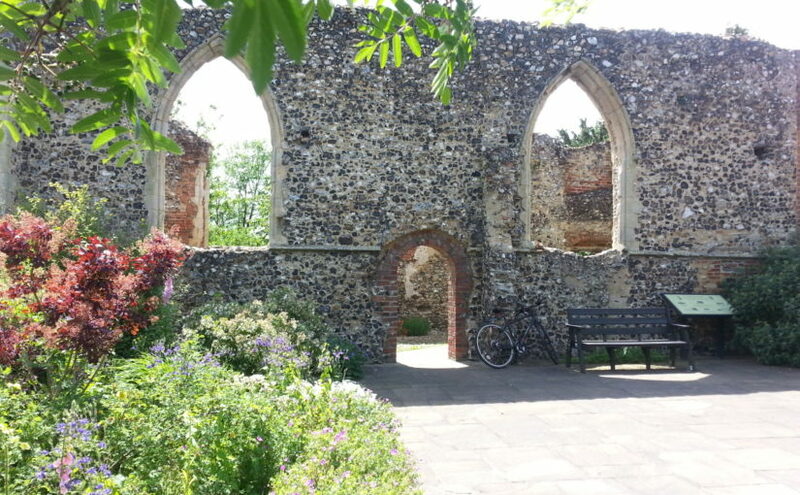 Felicity was at the university today, so I hired a bike and set of to explore the area south and west of Norwich. When I reached the junction with the current rail line, I joined the outer circuit pedalway which circumnavigates the city. It uses paths and lanes where possible, but some sections run along roads, usually with a dedicated bike lane thank goodness. After passing through Danby Wood which is an old quarry site now covered in large trees, I detoured off the path to explore Marston Marsh. This involved some narrow gravel footpaths, and even some dirt trails much to my delight. I stopped to take a photograph of the Yare river, which is tiny on this side of town compared to the wide expanse downstream at Great Yarmouth where we walked yesterday. There were some brave kids enjoying a summer swim, but I could see they were wearing wetsuits. A small lane led me to the village of Cringleford, which has been inhabited since the Bronze Age. I didn’t see any sign of the river Cringle, but maybe the this was another name for the Yare in historic times. These villages are now part of Norwich, and inhabited by the upper classes judging by the first “Vote Conservative” election signs I have seen. I rode past the University of East Anglia where Felicity was hard at work, and eventually came to another village called Bowthorpe. This was mentioned in the Domesday Book, so it has been in existence for at least a thousand years. The ruined church probably dates from the middle ages, and was repaired in 1636 before being abandoned in 1790 when the roof collapsed. I stopped to eat lunch and admire the beautiful gardens surrounding the ruins. 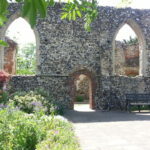 This village was almost entirely depopulated by the 1800s, but in the 1970s it was re-developed to provide housing within commuting distance from Norwich. I was impressed to find paths radiating out from the central shopping center allowing pedestrians and cyclists to avoid the roads. There is quite a bit of construction happening in the vicinity, which meant I did a few circles through new subdivisions before finding the pedalway again. 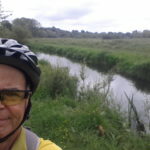 On my way back towards town, I rode circuits of both the 20 Acre Wood then Earlham Cemetery before joining the first section of Marriot’s way where I had started my previous ride. I was tired by this time after over four hours in the saddle, so I followed the National Cycleway Route 1 straight through town instead of taking the longer off-road course around the river. Felicity arrived home having visited the market on the way, so we have enjoyed a dinner of pigeon breast and pasta, accompanied by some English wine produced not far from here. yes the hand made walls of the old bowthorp church are quite inspiring . gee you are a ball of energy john ,the ground you cover ,the detail you note . im lucky to have you as my correspondant . your selfie has placed the background where it should be / dont give up just yet . cheers , jayemm .